A notorious Muslim extremist told a demonstration in London yesterday that the Pope should face execution. Anjem Choudary said those who insulted Islam would be "subject to capital punishment". His remarks came during a protest outside Westminster Cathedral on a day that worldwide anger among Muslim hardliners towards Pope Benedict XVI appeared to deepen. The pontiff yesterday apologised for causing offence during a lecture last week. Quoting a medieval emperor, his words were taken to mean that he called the prophet Mohammed "evil and inhuman". He insisted he was "deeply sorry" but his humbling words did not go far enough to silence all his critics or quell the violence and anger he has triggered. He insisted he was "deeply sorry" but his humbling words did not go far enough to silence all his critics or quell the violence and anger he has triggered. A nun was shot dead in Somalia by Islamic gunmen and churches came under attack in Palestine. 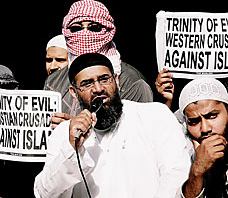 Choudary's appeal for the death of Pope Benedict was the second time he has been linked with apparent incitement to murder within a year. The 39-year-old lawyer organised demonstrations against the publication of cartoons of Mohammed in February in Denmark. Protesters carried placards declaring "Behead Those Who Insult Islam". Yesterday he said: "The Muslims take their religion very seriously and non-Muslims must appreciate that and that must also understand that there may be serious consequences if you insult Islam and the prophet. "Whoever insults the message of Mohammed is going to be subject to capital punishment." He added: "I am here have a peaceful demonstration. But there may be people in Italy or other parts of the world who would carry that out. "I think that warning needs to be understood by all people who want to insult Islam and want to insult the prophet of Islam." As well as placards attacking the Pope such as "Pope go to Hell", his followers outside the country's principal Roman Catholic church also waved slogans aimed at offending the sentiments of Christians such as "Jesus is the slave of Allah". A Scotland Yard spokesman said of his comments: "We have had no complaints about this. There were around 100 people at the demonstration. It passed off peacefully and there were no arrests." Larger Islamic groups in Britain said they accepted the Pope's apology. Inayat Bunglawala of the Muslim Council of Britain said: "The Vatican has moved quickly to deal with the hurt and we accept that. "It was something that should never have happened - words of that nature were always likely to cause dismay - and we believe some of the Pope's advisers may have been at fault over his speech." Yesterday's sermon by the Pope was the first time a pontiff has publicly said sorry. He said he regretted Muslim reaction to his speech and stressed that the quotation did not reflect his personal opinion. Anger and violence - including attacks on seven churches in the West Bank and Gaza - have characterised one of the biggest international crises involving the Vatican in decades. The Pope appeared determined to move quickly to try to defuse the anger but the fury of many radicals was unabated last night and there were fears for his safety. Iraqi jihadists issued a video of a scimitar slicing a cross in two, intercut with images of Benedict and the burning Twin Towers. The website run in the name of the Mujahedeen Army, used by extremist groups who have claimed responsibility for attacks in Iraq, was addressed to "You dog of Rome" and threatened to "shake your thrones and break your crosses in your home". In a reference to suicide bombing, it said: "We swear to God to send you people who adore death as much as you adore life." The threat of violence against Catholics and Christians was emphasised by the murder of an Italian nun in Somalia. Sister Leonella, 66, was shot as she walked from the children's hospital where she worked to her house in Mogadishu, a city recently taken over by an Islamic government. A Vatican spokesman said he feared her death was "the fruit of violence and irrationality arising from the current situation". Father Frederico Lombardi said he hoped it was an isolated event. "We are worried about this wave of hatred and hope it doesn't have any grave consequences for the Church around the world," he said. The murder suggested that extremists are determined to use the Pope's embarrassment as an excuse for violence. In Turkey, state minister Mehmet Aydin said the Pope seemed to be saying he was sorry for the outrage but not necessarily for his remarks. "You either have to say this, 'I'm sorry' in a proper way or not say it at all," he told reporters in Istanbul. There were fierce denunciations of the pontiff from Iran. The English-language Tehran Times called his lecture in Bavaria last week "code words for a new crusade". The powerful cleric Ahmad Khatami told theological students in the holy city of Qom: The "Pope should fall on his knees in front of a senior Muslim cleric and try to understand Islam." But the Turkish government signalled it was content and that the Pope's visit to the country in November can go ahead. In his sermon yesterday at the Papal summer residence of Castel Gandolfo outside Rome, Benedict spoke amid strengthened security. He said: "I am deeply sorry for the reactions in some countries to a few passages of my address at the University of Regensburg, which were considered offensive to the sensibility of Muslims. "These in fact were a quotation from a medieval text, which do not in any way express my personal thought. I hope this serves to appease hearts and to clarify the true meaning of my address." No other Pope is thought to have made such an apology.